This giveaway is now CLOSED. Thanks so much to our wonderful sponsor Crest (and our friends at One2One Network for facilitating this giveaway)! We look forward to having them back again! Our winner is Linda K.! Congrats! Remember: There are great giveaways active on the upper right hand side of the page! 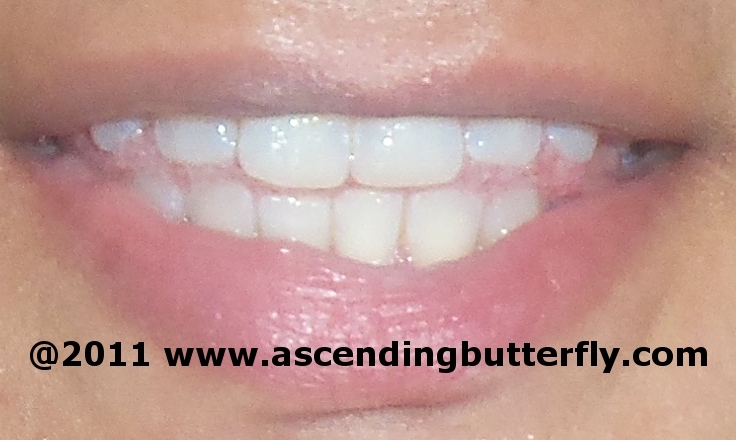 As you can see from the before and after photos, I now have a much brighter smile! Ƹ̵̡Ӝ̵̨̄Ʒ - Do not brush teeth immediately before applying strips. Ƹ̵̡Ӝ̵̨̄Ʒ - Apply gel side of strip to teeth. Ƹ̵̡Ӝ̵̨̄Ʒ - Align strips with gum line and press gently for good contact, then fold the rest of strip behind teeth to keep in place. (work quickly or the edges will stick to your lip! Definitely do this in the mirror). 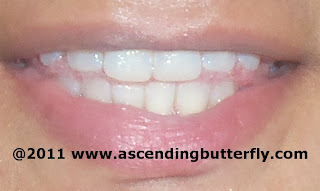 Ƹ̵̡Ӝ̵̨̄Ʒ - Short strip goes on your bottom teeth, long strip on top teeth. Ƹ̵̡Ӝ̵̨̄Ʒ - After 2 hours, remove and discard. Ƹ̵̡Ӝ̵̨̄Ʒ - If any gel remains on your teeth you can either brush it away or rinse it off. 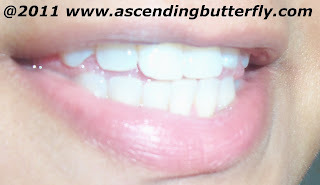 Ƹ̵̡Ӝ̵̨̄Ʒ - Strips will not whiten caps, crowns, veneers, fillings or dentures. Do not use with dental braces. Crest 3D Whitestrips are definitely cheaper than a trip to the Dentist (however you should get a Dental checkup and cleaning at least every 6 months) and easy to use in the convenience of your own home! What's not to love? I have also had the chance to try out the Crest 3D White Advanced Vivid Enamel Renewal Toothpaste and I find that the combination is a great whitening one-two punch! And the toothpaste really leaves your teeth with that fresh from the dentist kind of clean! I have always had pretty white teeth, and this is the first time I have ever tried out a whitening product. But using the strips in conjunction with the toothpaste left me a dentist white and clean feel. I definitely think it was worth it! Ƹ̵̡Ӝ̵̨̄Ʒ - WIN IT! - Ascending Butterfly and our friends at Crest would like to give 1 lucky winner a box of Crest 3D Whitestrips, which will provide one year of whitening! Don't you just ♥ Crest 3D White? I know I do! FTC Disclosure Info for this Giveaway: I was provided product to facilitate the review and giveaway. The sponsors are fulfilling directly to prize winner(s), this in no way influenced my opinion of the products. Once a winner is selected and their information has been forwarded to the sponsor, the responsibility of prize fulfillment rests with the sponsor. I am eligible for additional incentives by participating in this campaign for one2one network. Well, I am going to a taping of the Dr. Phil show. Does that count as an event? I live a boring life. I'd love to use the whitestrips for my sister's wedding in november. I am starting a new job. I would love to use these for a wedding I am attendng soon. Forgot to mention in my first comment that I already follow you via GFC as nightowl. I would like to use them for my sister's wedding. Next month we have several birthdays in the family including mine so I'd like to achieve the whitest smile by then for those picture-taking moments. I have never tried whitestrips before... i would use them before visiting my best friend in Kansas this fall...we always have to out do eachother in a fun way! I would like to use these for when I go to my friends wedding. I would like to use them as I am going back to college soon. I would love to give these to my daughter when she gets her braces off in a couple months! I follow your blog on GFC, subscribe to you email and like you on Facebook! I would love to win this so I could use it for my husband's office party! Thanks so much for the fantastic giveaway! I'd use them for an upcoming wedding. I would use them for an upcoming vacation! I would love to use these for a party I'm going tp. Nothing special - just perhaps a date weekend with my hubby! I like ascending butterfly on FB - MArianna B.
I follow you via GFC. These would come in handy when I go home for Christmas. And I'd love to have whiter teeth for my family pictures coming up for Christmas! I am going to start job hunting and would like to use these for that reason. These would've been perfect for my wedding a couple weeks ago, but I would use them now for some family photos that need to be taken before Christmas. I'm a GFC follower! Follow as walindeman. I'd love to use these for my wedding! I'm getting married one year from today! Follow Tracy Iglesias on Twitter as @whitneylindeman. Follow Ascending1 on Twitter as @whitneylindeman. Follow Crest on Twitter as @whitneylindeman! Follow Crest on Facebook as Whitney Lindeman. These would be great for when my guy and I go out for his birthday! I would like to use 3d Whitestrips for my wedding! Thanks for the giveaway. I'd use them before an upcoming friend's birthday party! I'm a gfc follower and my email is in my profile. Thanks! 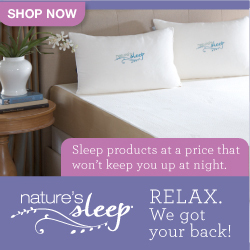 I follow you on grf and I would use these before my next upcoming scentsy party! I am going to be in a wedding (which obviously means lots of photos) next month, so having shiny, white teeth would be a real plus. I would love to use these for all of the upcoming holiday get togethers. I am attending a book release party celebrating the power of women. I follow you on GFC, follow @Tracy_Iglesias, @Ascending & @crest on twitter (my twitter is @MsNYBL2011). I don't really have an event that is coming up. My teeth just aren't that white and I can't afford to get them professionally whitened. I have heard the 3d whitestrips are amazing and would love to use them. I follow your blog. I would like to use Crest 3D Whitestrips for my friend's birthday party. I follow @Crest on Twitter under the username likwan. I tweeted the requested message on Twitter at https://twitter.com/#!/likwan/status/117303038007443456. I follow Crest on Facebook and let them know you sent me at http://www.facebook.com/CrestWhitestrips/posts/10150328807638706.